Wedding Car Hire Melbourne – Choose a Classic Jaguar! You’re planning your big day, and it’s time to choose your wedding car hire Melbourne. A Jaguar is a classic choice for anyone who loves some glamour. When it comes to wedding car hire Melbourne, there’s nothing that can guarantee added beauty and sophistication to your wedding like a vintage car. And among the huge range of brands and cars to select from, vintage Jaguar cars stand alone. 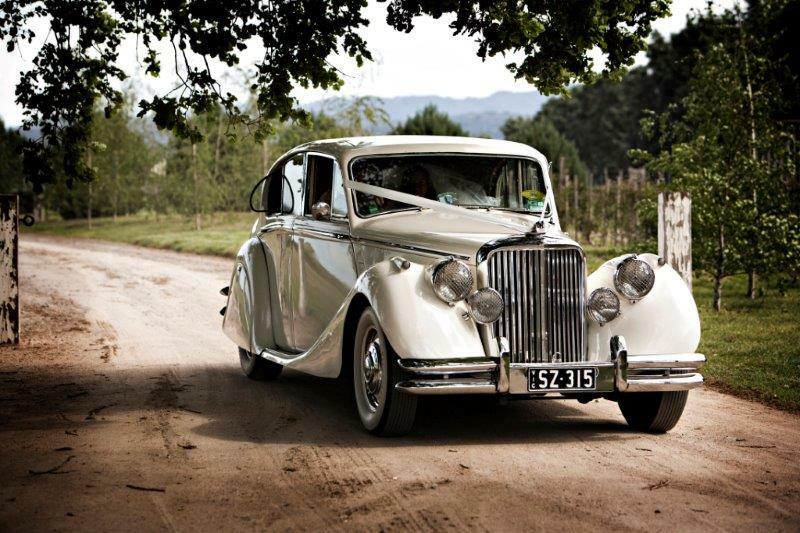 Impeccably crafted elegant classic Jaguars are the perfect wedding car hire Melbourne. With JC Jags, you not only have a quality vehicle at your disposal, but you also have an experienced and knowledgeable chauffeur to transport you in style. Powerful, smart, cool and regal… classic-style Jaguars are the embodiment of the dream car. Seen often in film, television and at car shows and clubs, choosing a Jaguar will furnish your wedding with an extra special effect that will stay with you forever. The wonderful design of a classic Jaguar, with its balance of smooth curves and sharp lines, tasteful colour schemes and vintage wheels, is the ultimate complement to the refined European-inspired streets of Melbourne. In a city brimming with some of the most picturesque wedding locations in Australia, our Jaguars fit right in. The Jaguar was designed in England, so there is no better Australian city than Melbourne to fully appreciate the aesthetic of the world-famous classic car. While there are numerus classic cars to choose from for your wedding, selecting a Jaguar brings a unique refinement along with a renowned household name, which will instantly increase the prestige and elegance of your special day. Wedding photos are one of the most important parts of a wedding. To capture the emotion and splendour of a wedding, the location, positioning and scenery must be carefully selected. Years after the event, your photographs will be a pathway to reminisce. To ensure fantastic photographs you’ll be sharing with pride for years to come, a Jaguar from JC Jags is the most luxurious vintage wedding car hire Melbourne can offer. Classic Jaguars at JC Jags are also just as great inside as out. Clean, slick leather seating, polished wood and plenty of space, they now include modern air-conditioning for added comfort. The immaculate artisan craftsmanship that comes with each vehicle provides a truly unforgettable experience. A Jaguar from JC Jags is not just about transport for your special day – it’s about creating an experience that will relax, excite and make your wedding as unique and classy as the car itself. For an obligation-free chat or quote, contact JC Jags today. Alternatively, follow us on Facebook and check out photos from happy couples and beautiful weddings all across Melbourne. We’ll help you get to your destination in style!